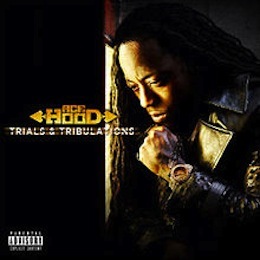 Truth in advertising, Ace Hood’s debut album Gutta is stuffed full of tough thug music with the extra benefits of high-profile friends and expensive, major-label productions. Sure, silky smooth crooner Lloyd lands on the Florida rapper’s debut along with superstars Akon and T-Pain plus DJ Khaled who executive produced it all, but Hood’s cocksure and rapid-fire delivery is as dirty as Plies and heavily influenced by the aggressiveness of 2Pac. While lyrically he’s far behind Pac, and only some of his punch lines are knockouts, his primal words are no embarrassment. The title cut finds him holding his own with veteran and homeboy Trick Daddy, all over a sample of the disco classic “Turn the Beat Around,” now twisted into something hood and crooked. Plies himself shows up for the great “Stressin’” which deals with “knocking-up” the wrong girl and the strife that comes with “running out of blessins.” In the spirit of Khaled’s “Out Here Grindin’” where Hood made his debut singles “Cash Flow” and “Ride” are both very Florida anthems thanks to their smooth hooks and guest appearances from local hero Rick Ross. Last of the big numbers is “Money Ova Here” a solo showcase that’s lean with a killer hook but the rest is all B+ material with no filler in sight. Even if Hood doesn’t claim the game with a new, fresh style, Gutta is a fine debut and should satisfy fans of the Sunshine State’s harder side.